and this line has eight syllables. This line makes you think of bears. This line is set apart from the rest. This line is nothing without you, reader. Maybe only the punctuation will remain. Nope, not even that, this line says. This line won’t finish itself, it needs me. The day doesn’t need me to finish. bears will still grizzle or be stuffed cuddlers. All of these lines need you. This is the cake I baked for my mother's birthday. She loves lemon! 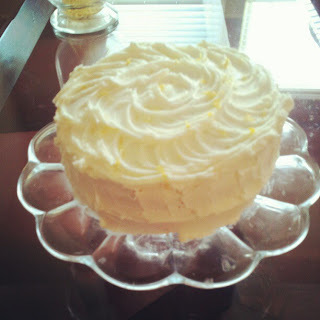 So do I, so I've been experimenting with lemon cake recipes, tweaking and adding, subtracting, and tweaking again. This one is based on a Martha Stewart cake recipe which I found on the Everyday Food website, but I changed some of the ingredients and added a couple. This is a keeper, and I'm calling it The Sixth of February, because that's my mother's birthday. If you ask me for a lemon cake, and I like you, this is what you'll get. Preheat the oven to 350. Butter two 8-by-2 inch round cake pans; line the bottoms with parchment paper. (This is a pain in the rear. I trace the bottom of the pan on the parchment paper, cut it out, and then use the first one as a pattern for the second. If anyone has a better suggestion, I'm all ears!) Butter the parchment once you've placed it in the pan, and dust with flour. Tap out all the excess. In a medium bowl, sift together the flour, salt, and baking powder. Set it aside. Grate the rind of the lemon into a small bowl. Halve the lemon and juice it, taking care not to let seeds into the juice. Use the paddle attachment on your mixer, and beat the butter and the sugar until light and fluffy. Be sure to scrape down the sides of the bowl as needed. Beat in the eggs one at a time and add the vanilla. With the mixer on low, add the flour mixture a little at a time, alternating with the buttermilk. Add the juice of the lemon and the lemon rind last, and mix on low until it's blended. Divide the batter between the two pans evenly, smooth with a rubber spatula, and tap the pans on the counter to release any air bubbles. Bake for 30-35 minutes, rotating the pans in the middle of the baking process. Put the pans on a wire rack to cool for 20 minutes, then flip, and peel off the parchment. Invert the cakes on the racks and let them continue to cool with the top sides up. When the cakes are cooled, use a serrated knife and trim the tops of the cakes to make them level. (What a shame! You'll have to taste the extra pieces!) Split each layer into two so you have a total of four layers. Place the bottom layer on a plate or cake stand and with an offset spatula top with some lemon curd, spreading it evenly but leaving an inch of bare cake on the outer edge. Place the second layer on top, and repeat the process until you get to the top of the cake. For frosting, you're on your own. Don't feel cheated. I'm not much for measuring during this process, I test as I go along. I make a simple buttercream frosting (butter, confectioner's sugar, vanilla, dash of milk), and add a little lemon juice to it. I'm not much for measuring during this process, I test as I go along, which is why you're on your own. Have fun! in a park where no one even sleeps anymore. between black gloved, very important men. that everyone tries to latch shut. or someone shoves an eggplant in a tuba. Oh, my blastoff of lions, my symphony of planets! are in the story that is very near the sea, see? I am trying to take you home with me.